FROM THE CO-ORDINATOR EURO MILLIONS SWEEPSTAKE Amsterdam,The Netherlands. Sir/Madam, CONGRATULATIONS: YOU WON 1,000,000.00 EUROS. We are pleased to inform you of the result of Euro Millions Sweepstake,which was held on the December 15, 2006. 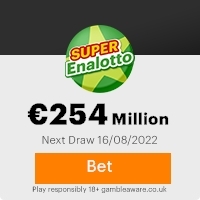 Your e-mail address attached to e-ticket number: 05-32-44-45-50 (01-07),with Prize Number : 106000007 drew a prize of 1,000,000.00 (One Million Euros). This lucky draw came first in the 2nd Category of the Sweepstake. You will receive the sum of 1,000,000.00 (One Million Euros) from our authorized bank. Because of some mix-up with sweepstake prizes, including the time limit placed on the payment of your prize: 1,000,000.00 Euros, we advice that you keep all information about this prize confidential until your funds:1,000,000.00 Euros have been transferred to you by our bank. You must adhere to this instruction, strictly, to avoid any delay with the release of your funds to your person. This program has been abused severally in past,so we are doing our best to forestall further occurrence of false claims. This sweepstake was conducted under the watchful eyes of 8,000 spectators. Your e-mail address attached to e-ticket number 05-32-44-45-50 (01-07) was selected and; it came out first by an e-ballot draw from over 250,000 e-mail addresses (personal and corporate e-mail addresses). This program is sponsored by CFI to compensate faithful internet surfers around the globe. Congratulations for becoming one of the few lucky winners. With your permission, your e-mail will also be included in the next sweepstake of 5 Million Euros. You must claim your prize: 1,000,000.00 Euros not later than 14-days from the moment you receive this e-mail. In order to avoid unnecessary delays with your claim from the bank; please contact them immediately, and quote your winning and personal information now, and in all your correspondence with the bank. Here is the contact information: Bank: Laagste Heypotheekofferte Bank. N.L. Attention: Dirk Garvin. Karspeldreef 6A,1101 CJ,Amsterdam,Netherlands. E-mail: laagsteclaims@aim.com Telephone: +31626465225. Fax : (+3184) 725 0512 Furnish them with the following: (1)YOUR NAME(S) (ii)CONTACT ADDRESS (iii)YOUR TELEPHONE AND FAX NUMBERS (iv)A PROOF OF IDENTIFICATION(OPTIONAL) (V)YOUR TICKET NUMBER (vi)AMOUNT WON Yours faithfully, Blijke Johanna Diedrich(Ms.) Promotions Manager, Euro Millions Sweepstake. This Email with the Subject "Call for Confirmation." was received in one of Scamdex's honeypot email accounts on Mon, 18 Dec 2006 16:00:59 -0800 and has been classified as a Generic Scam Email. The sender shows as "Sweepstake." <blijkejdiedrich@myway.com>, although that address was probably spoofed. We recommend that you do not attempt to contact any persons or organizations referenced in this email, as you may expose yourself to scammers and, at the very least, you will be added to their email address lists for spam purposes.